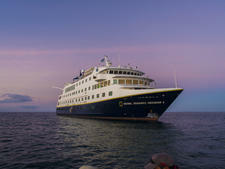 If you've never traveled aboard an expedition ship before, Lindblad's National Geographic Quest is a great place to start. This stalwart cruise company set many of the standards for expedition cruising and broke much of the new ground for the entire small ship industry, and their many years of experience is evident in their delivery. 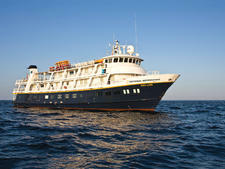 This ship, while not lavish or ostentatious, provides a good balance between comfort and function, and is designed with the sole purpose of delivering the best possible expedition experience for both new and repeat Lindblad cruisers. 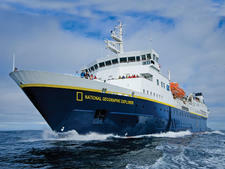 National Geographic Quest was purpose-built by Lindblad for its mainly U.S. demographic. Drawing on 50 years of expedition cruising experience, you will find everything aboard is cleverly constructed and included (or excluded) based on lots of customer feedback. Apart from National Geographic Orion, which the line inherited from another, defunct cruise line, Lindblad vessels are comparatively austere. This "clean sheet" design recognizes that the ship's purpose is primarily to get you to, and accommodate you at, the destination and act as a base for your explorations. If you are hoping for waist-coated butlers, free-flow Champagne and sparkling chandeliers on National Geographic Quest, you will be disappointed. Yet, despite the fact that many passengers are well-to-do and high achieving professionals, the absence of such glamour is no deterrent. 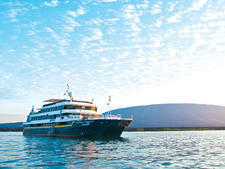 In fact, this is more likely to be an attraction for Lindblad's passengers, knowing that all the investment has gone directly into facilities and equipment that help you get the most out of your destination rather than flashy distractions. Service levels from both cabin crew and expedition staff is familiar and relaxed. The predominantly American ship crew, whether they are in the kitchen or on the rigid inflatable boats share the same passion for the wilderness and are eager to engage in discussion about your own interests. 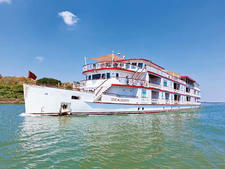 All the while, your cabin, table and lounge are quickly and efficiently attended as on any other top-rated vessel. Environmental awareness extends beyond the lecture program and pictures of whales and sea lions into such things as low plastic use, power saving and waste management. Single use plastic water bottles have been gone from Lindblad ships fleetwide for several years and you won't find plastic straws either. Containers and snack trays are either reusable or biodegradable. 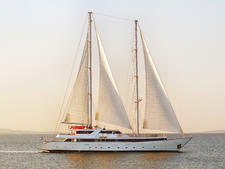 The new ship does not completely ignore trends in the small ship arena, however, with dedicated spa and gym facilities and nearly half the cabins with private balconies. An elevator is also a welcome addition. 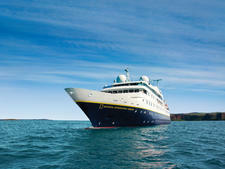 When considering Quest for your expedition cruise, know that you will be truly immersed in your destination. You'll come back from the Panamanian jungle sweaty and muddy, but thrilled that you've seen a rare slaty-tailed trogon or been shadowed by patrolling bald eagles in your kayak in Alaska. 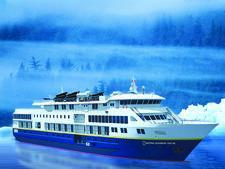 While the general makeup of passengers is largely mature Americans, traveling as either couples or singles, Lindblad encourages younger people, too. It's not unusual to find at least one family with older children or active grandparents. A parent or parents with adult children is also common. Because the nature and theme of Lindblad voyages is discovery and enrichment, many passengers are college educated, professionals or academics seeking intellectually stimulating interpretation during their travels. You may find yourself chatting at dinner with a college professor or retired judge. International guests are likely to be around the 10 percent mark or less from English-speaking countries like the U.K., Canada and Australia. Announcements are only made in English. You'll find most guests will dress informally in brand name adventure wear, even for dinner. Neat and practical is more important than showy, so you can safely leave the sequins at home. Otherwise a comfortable shirt and blouse, slacks and sensible shoes are all that's needed. As Quest is currently only sailing Alaska and the Pacific Northwest in summer and Central America in the northern winter, daywear is important. Not so much from a fashion sense but from a practical point of view for the environmental conditions expected. In the tropics, cool, light and sun smart is the key with long sleeves, wide-brimmed hats and walking shoes and water-friendly sandals like Tevas, Crocs or Keens. In cooler destinations, a beanie, fleece and waterproof spray jackets and pants are de rigueur. In Alaska, wet landings will require gumboots. 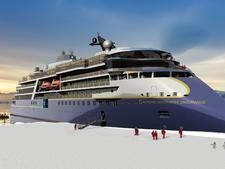 As with many expedition cruise vessels, much of what you came for is included. Typically, that will mean all meals, excursions and any onboard enrichment lectures. Quest carries watercraft like kayaks, use of which are also included in your fare. In some ports, optional excursion choices are available for an extra cost, as are any pre- or post- extensions you may choose. 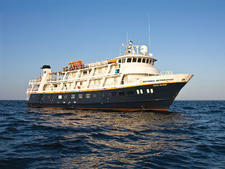 Some Lindblad vessels are all-inclusive for beverages and gratuities, but National Geographic Quest is not. While nonalcoholic drinks like tea, coffee and sodas are included, your wine with dinner and cocktails at the bar are charged extra. Wi-Fi costs extra as well, and optional gratuities are suggested at $10 per person, per day. Group airport transfers are included and any tips for drivers or porters are handled by the cruise line. Wellness treatments onboard are not included. Onboard currency is the U.S. dollar, but you will rarely need cash except for a few occasions ashore.